As a component of the Warm Tile® FTS and ET model Thermostat Kits, an extra temperature sensor can be purchased separately in the event the original sensor is damaged during installation. It can also be used as a redundant sensor to provide "peace of mind" in the event of a failure. Although a failure is rare, it is not impossible, and the installation of a spare sensor is inexpensive insurance. 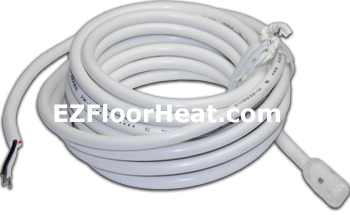 When installing a second sensor, follow the installation instructions included with all Warm Tiles® floor warming kits. Connect only one floor sensor to the thermostat at any given time, and leave the other disconnected as a spare. If it's ever needed, simply disconnect the defective sensor wires, and connect the spare wires.